Toronto Hyperbolic Crochet Reef: Roadside Reef. It's alive! 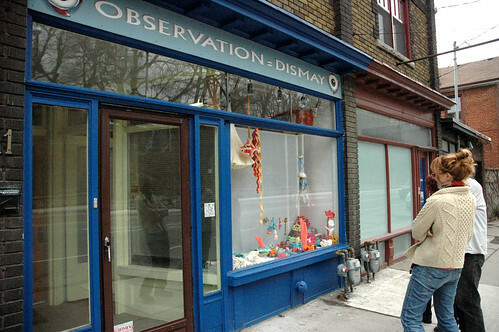 After a couple years of hibernation in a suitcase (and some major growth) the Toronto Hyperbolic Crochet Coral Reef is back on display at the glorious Roadside Attractions window gallery on Davenport. More pictures are forthcoming - we need to see what this thing looks like all lit up at night! Until then, enjoy these teasers and get your buns out to Davenport and Christie. This baby is up 24/7 for a month! We'd like to also give a big shout out to Roy and Kate for booking the reef, maintaining this space for art in the city and giving us tea and coffee. We hope your kettle survives. What a visual treat! Much needed colour and fun especially at this rather drab time of year! If I want to contribute a piece, are there specs about what yarn is preferred, or suggested patterns? and mary, we don't have any specs per se. we should probably devise some guidelines, though. for now - if it looks like coral or a sea thing, that's great! we mostly try to use discarded or second-hand materials to lower the environmental impact of the project. leftovers and scraps are ideal. there are even models in there made from plastic bags. and bold or light colours seem to work best. The Toronto Hyperbolic Crochet Reef is a collective project of endless crochet for the city of Toronto. 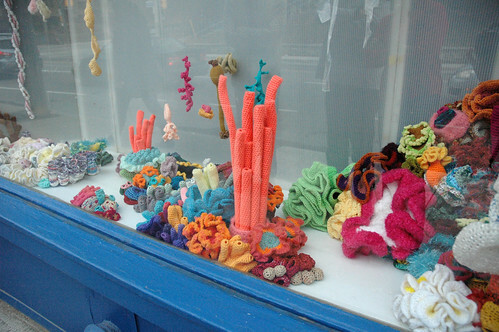 Inspired by the pioneering work in hyperbolic crochet of Dr. Daina Taimina and the artful modelling projects of the Institute for Figuring in Los Angeles, the Toronto Reef is just one in a great confluence of reefs worldwide. The reef is run and mostly built by Angelune Des Lauriers, Shannon Gerard, Kalpna Patel and Becky Johnson but it remains open to coral contributions from anyone in the city.